Today the littlest man in the house is two years old. Simon is outgoing and normally happy, but has recently started answering everything with an emphatic “no!” or “no Mommy!” He seems right on schedule for the so-called “terrible twos.” He continues to amaze me with how much he talks. His latest cute thing is to say “I’m going to work!” I say, “Okay, have a good day!” and he says “bye bye!” I love how he says it. He loves trains and if we pass a train or train tracks while driving he will tell you loudly that he wants more train! He will eat almost anything and his current favorites are watermelon, bananas, and pizza. He can sing the ABCs and count to 10. He likes Mickey Mouse and Callilou and loves music and singing. 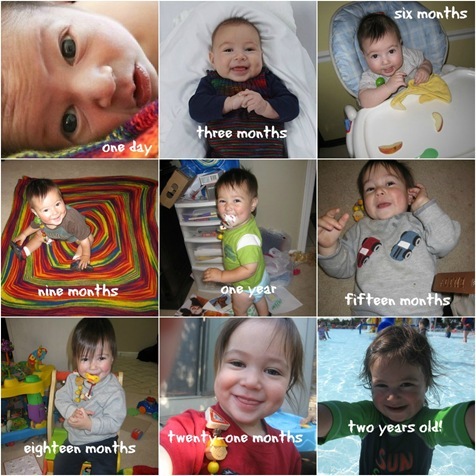 Simon, we love you and can’t wait to watch you grow for many more months and years!